Cyclonic storm Force 12 ! Its not often we hear the BBC Shipping Forecast start with the words “There are warnings of gales in all areas except Trafalgar…” as I write this the wind is howling around the South Downs and the coast around Brighton…but look at this for the …for a weather forecast..
Cyclonic storm 10 to hurricane force 12, becoming west or southwest 7 to severe gale 9. High or very high. Rain or wintry showers. Moderate or poor, occasionally very poor. 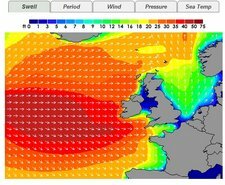 The screen shots here are from the excellent Magic Seaweed site…who do a really good job of showing wave heights and near shore effects for surfers and of course therefore for coastal cruisers. The wave heights in mid Atlantic are shown as 50-75ft and the wind speeds up to F12 of the north coast of Scotland. 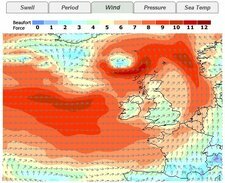 I really would not want to be fishing off the north coast of Scotland tonight! Russ January 18th, 2009| 2 comments - be the next!|Tags: Weather - Wind. 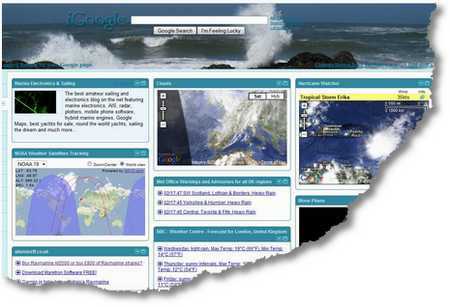 There are a number of subscription services for weather data, but I really think that whether you are experienced or a novice sailor it is a good idea to practice reading barometric and other weather data for yourself to get accustomed to the connection between the data and the summary weather forecasts that are available from the US and UK Met Office. Please note I am not saying that you can substitute for listening to and heeding the Inshore and Shipping forecasts – but these resources and sofware can help your own decision making in terms of passage planning. Of course what the paid for services add is “interpretation” and “prediction”…and we all know how accurate the weather forecast is on the TV…well in England that would be funny – perhaps the weather is forecast accurately in your part of the World? There are many models for forecasting but the most prevalent is the US National Center for Environmental Prediction (NCEP) – GFS Model. Below are a large number of free resources and software that would make you fully capable of seeing all sorts of up to date weather data for FREE. You don’t even need fancy software to see these pictures – just double click and the browser (IE or Firefox) will just display the picture for you – and you can save them to your laptop/PC for viewing later when you may not be able to get an internet connection. GRIB file data goes a step further by giving wind direction and speed using an easy to understand “barbed feather”. 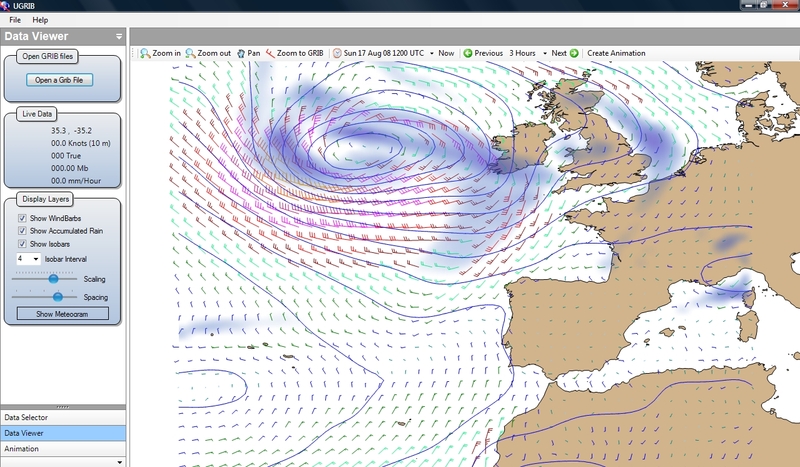 This saves you having to measure the distance between isobars to calculate wind strength. Some software even draws isotechs which are lines of constant wind speed. and some software draws arrows of different dimension and colours to represent speed and direction. But, I use the simple free service from UGRIB. This service gives you a free worldwide viewer and free GRIB files for any area that you care to select. You can select GRIB file area by just drawing an area on the map of the world and then the software downloads that area’s data alone – thereby saving on bandwidth for the download, which si a real boon if you are connected to the internet using your GPRS enabled phone! – click on the image for a larger screen shot. If you have an SSB receiver on board such as the NASA SSB, then you can even get all sorts of free data while on the high seas and no where in sight of an internet connection…yes there are places such as these! WEFAX is a method to transmit weather facsimile images over radio. Most images are transmitted in black and white, although some are grey scale. To receive wefax images, you need a shortwave receiver and a software decoder to convert audio tones into black and white. Tuning the receiver accurately is a tricky and time consuming process, but essential to receive acceptable pictures. You then have to clean up the audio signal by appropriate filtering to isolate the black and white “tones”. The connection from the NASA SSB is a cable that plugs into the microphone input on my laptop, and when in operation sounds just like a fax machine or old analogue modem. The program I use is SeaTTY. This can receive weather reports, navigational warnings and weather charts transmitted in RTTY, NAVTEX and HF-FAX (WEFAX) modes on longwave and shortwave bands. It can decode GMDSS DSC (HF and VHF) messages. The software can also automatically save NOAA Weather Radio SAME voice messages (NWR SAME) and the digital headers. No additional hardware is required — you need only a receiver and computer with a sound card. 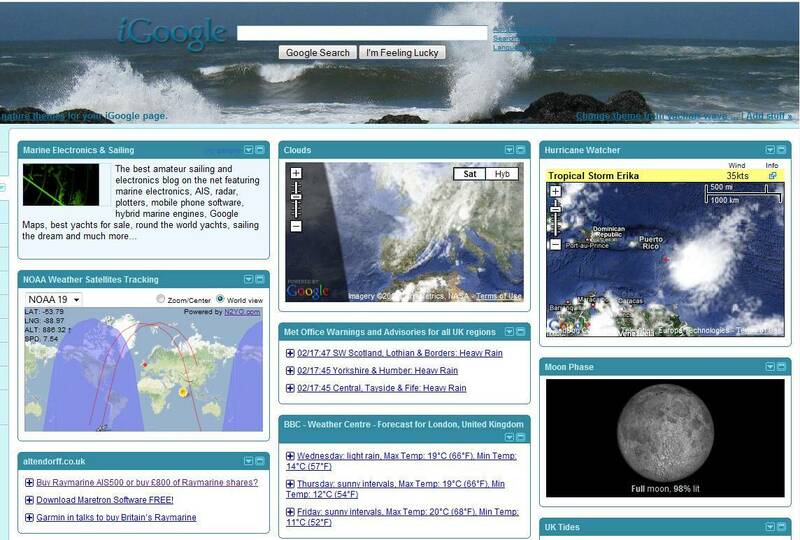 Russ August 16th, 2008| 3 comments - be the next!|Tags: Navigation - Navtex - Software - SSB - Weather - Wefax-RTTY-Navtex - Wind. Portable wind power v solar power ? 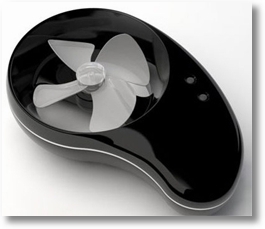 This personal wind turbine called the HyMini can be hooked up to various devices to charge your phones, cameras, and other small electronics when you are on the road or on the sea..
Russ December 11th, 2007| 6 comments - be the next!|Tags: Electronics - Solar - Wind.